Who gets excited when talking about race nutrition and hydration? No one? As a registered dietitian (and coach! ), I will say, nutrition and hydration actually “excite” me. They are two variables that you have 100% control over. You cannot say this about many things on race day! You can’t control the weather, you can’t control the competition, you can’t even control (to some extent) how your body will feel. But you CAN control what you put in your mouth to fuel you for 100 miles or 100km. So, let me share a little of my excitement with you! First, a little story. A friend of mine made her first attempt at the 100 mile distance in Vermont several years back. She was well trained and ready for the day. But by mile 60 she was feeling pretty dizzy. By mile 70, when she picked up her pacer, she added some confusion to the dizziness. At one point, her pacer kindly asked “you know you are only talking to me in a whisper, right?” I laughed when she was telling me this story, envisioning my friend suspiciously whispering so the trees couldn’t hear her…. But by mile 83 she was sitting at an aid station, and then laying down and then, she woke up in the hospital. And just like that, her day was over and her goal not met. Classic signs of hyponatremia (abnormally low sodium concentrations in your blood caused, in this case, by drinking too much water). My friend had eaten well and drank fluid, but she only drank water and a “little electrolyte here and there.” And that mistake cost her the day. 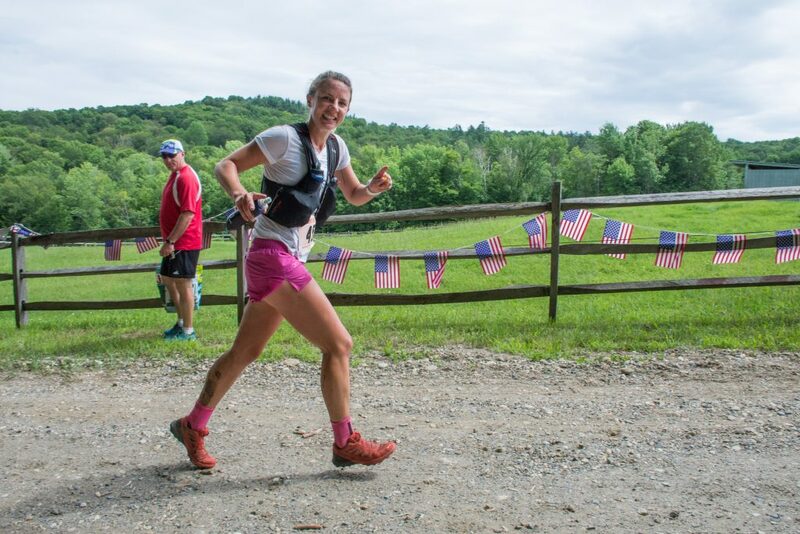 Below are some tips to helping you manage your hydration to avoid making these same mistakes, and successfully cross that VT100 finish line with a smile on your face and a loud WOO-HOO! (although if you’d like to whisper, that’s okay too, it just won’t be because you are hyponatremic though :). Weigh yourself with no clothing on, before the test. Run for 1 hour at roughly the same intensity and (if possible) the same conditions that you will race at/in. Do NOT drink anything during the test run or urinate during the run. Weigh yourself, again with no clothing on, after the test. The difference in weight #1 and #2 is what we are looking for. Each pound lost is equal to roughly 16 oz of fluid. That then converts to your fluid needs per hour. For example: weight #1 = 146.3 lbs, weight #2 = 144.8 lbs ——> the difference in weights = 1.5 lbs x 16 (number of ounces in fluid/lb) = 24 ounces/hour. It is important to note that we do not need to replace 100% of our needs and SOME level of dehydration is acceptable in training and racing. However, even being dehydrated by 2% affects performance and, in addition, the nature of ultra running (ie: running for 24 hours straight!) doesn’t leave much room for error. Our next consideration is sodium concentration of your sweat. This varies widely among individuals and can be anywhere from 450 mg/16 oz of sweat, up to 700 mg/16 oz of sweat. Clues as to whether you lose a lot of sodium in your sweat (a “salty sweater”, I like to call them) or not, include – is there a ton of salt on your singlet/hat/face/skin when you are done with a workout? ; do you cramp often in training and racing?. If you answer “yes” to these questions, you are likely towards the higher end of the range. Multiplying your sweat test weight loss (from above example weight #1-weight #2 = 1.5 lbs) by the amount of sodium in your sweat (per 16 oz of sweat), will net you a rough estimate of your sodium needs per hour. So, in our above example (1.5 lbs weight loss during sweat test), let’s assume an average sodium concentration of 575 mg/16 oz sweat) = 862.5 mg sodium/hour. So now that you’ve determined how much fluid you need to drink and roughly how much sodium you need, the next logical question might be – WHAT should I drink to meet these needs?!? Here is the answer: SPORTS DRINK! Or, more specifically, an electrolyte and carbohydrate rich solution that provides roughly 500-700 mg sodium and 40-50 grams of carbohydrate/serving. 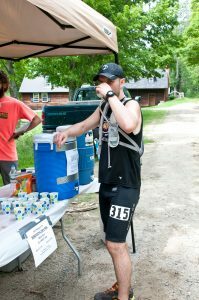 Many sports drinks meet these guidelines – Gatorade Endurance, Tailwind, Base Hydro (sports drink served on course at VT100), Skratch Exercise Hydration, and the list goes on and on. In addition, remember you will be eating sport fuels and food that also contain electrolytes to help you meet your needs. It should be noted that “water” is not on the list above. I simply do not recommend using it as a source of fluid in ultra distance events (or really any endurance events, for that matter), as it only serves as a “blank”, washing away critical electrolytes that you’ve already taken in and putting you at risk for hyponatremia. Sports drink, on the other hand, provides the fluid simple sugars AND electrolytes that you DO need, all in one shot. Seems like a no-brainer to me! And my friend from the opening story would agree. 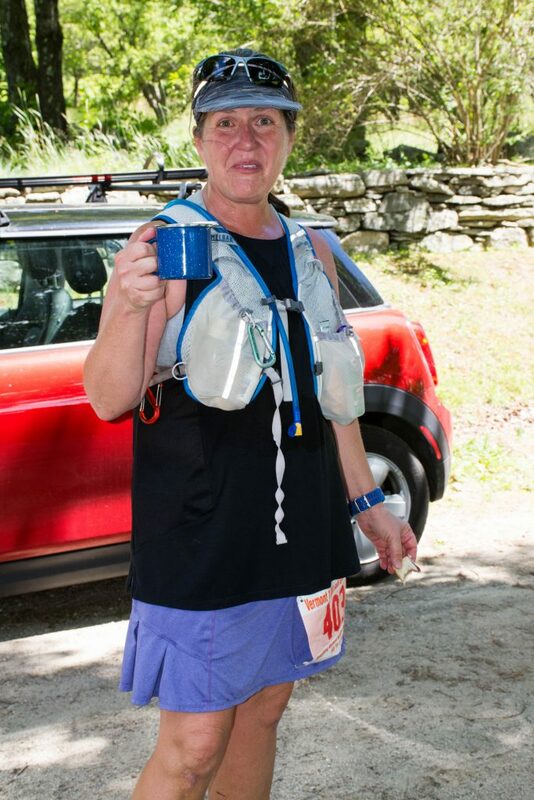 She uses sports drink now and has since seen multiple 100 mile finish lines. Next, know how to adjust. You might see anything (and everything) on race day temperature wise, including heat, cold, humidity, wind, rain, snow? (I wouldn’t put it past Vermont…), etc.. So although you choose to do your sweat test on an 80 degree day, what happens if race day dawns 35 and wet with a high of 50? Your sweat rate will obviously be lower in the cooler weather and higher in the heat, so pay attention to how you are feeling, if you are thirsty, and also the frequency and appearance of your urine. A good goal is to urinate once every 3 hours. If you are having to pee every 30 minutes, chances are, you are drinking more than you need to. On the other hand, if you are 6 hours into the race and you don’t even feel like you HAVE to pee, you are likely very behind on the hydration front. Also, you should urinate with some volume (a small “tinkle” doesn’t count!” and if you can see the color of your urine, it should be light yellow (vs a highly concentrated dark yellow). I have one final tip in managing your racing hydration strategy. What you do in racing, do faithfully in training as well. You cannot expect your body to tolerate X oz of sports drink in the race, if you do not consistently practice taking in X oz of sports drink on your training runs. 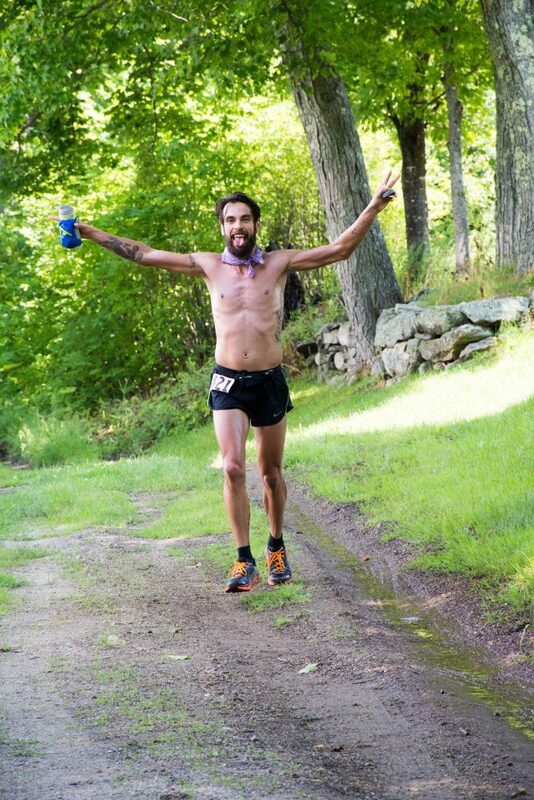 That would be like showing up at the VT100 finish line without having done any long runs! Okay, wait – ONE MORE THING! (I promise this is it). KNOW the signs of hyponatremia and discuss these with your pacer so that both you and your team can keep an eye out for impending trouble. Things to be on alert for: headache, confusion, decreased consciousness (all of which my friend had! ), seizures, muscle spasms or cramps and weakness/fatigue. I hope these tips help you think about and prepare your hydration strategy well for race day! If you are interested in delving further into your fluid AND calories needs (we didn’t even discuss what to eat!) and coming up with an entire fueling strategy, check out the fueling plans offered by The Core Diet. As a VT100 athlete, you can get a 15% discount on a fueling plan with the code ‘VT100’! Beth Shutt is a registered dietitian and the Operations Director at The Run Formula. She’s been an endurance athlete for over 25 years, including racing professional triathlon for 6 years. She has made every nutrition mistake in the book (including drinking water!) and loves to help people NOT make the same mistakes. She can be reached at beth@therunformula.com.